The French Groupama sailing team pictured at the start of Leg four of the Volvo Ocean Race to Auckland in Sanya, on southern China’s Hainan Island, on February 19. French boat Groupama’s breakneck pursuit of a Volvo Ocean Race Leg four triumph into New Zealand was being powered by "thunder-cloud power" on Friday after crossing the equator. The fleet faced a cluster of clouds packing gale force winds of up to 40 knots that can make or break a campaign in the testing stage between Sanya in southern China and Auckland. 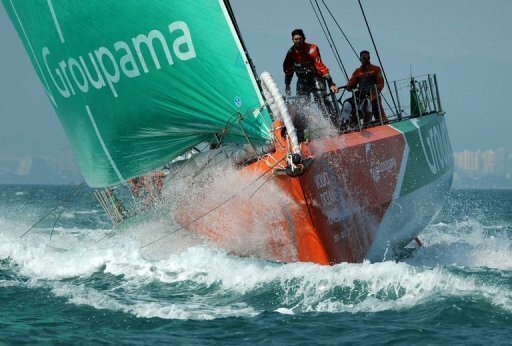 Franck Cammas, a newcomer to the 39-year-old race, and Groupama led their five rivals by just over 60 nautical miles with some 2,345 still to negotiate before arriving in New Zealand in just over a week’s time. US-led Puma were second with Abu Dhabi, overall leaders Telefonica and Camper all around 100 miles adrift of the French crew at 0700 GMT. The Chinese entry, Team Sanya, was 70 nautical miles further behind. Abu Dhabi’s British skipper Ian Walker described the challenge facing the boats, reporting that his team had veered 60 degrees off course at one stage in the face of a 38-knot gust. "It is a real test for the crews who need to rapidly reduce sail as fast as they can and hang on tight until the rain squall passes," Walker told AFP. "It is then a race to get back to full sail as the wind drops away behind the cloud." Camper, crewed by Team New Zealand, are desperate to make up lost ground caused by a split headsail midweek and see the storms as an opportunity to do so. "These thunder clouds pack a huge amount of power so you have to be constantly monitoring them to get the most out of them and avoid any potential damage, which is not what we need right now," co-skipper Stu Bannatyne told AFP. Playing the squalls to your advantage is as much a game of luck as it is a science, according to Walker. "It is safe to say we have been getting better at this with practice but there remains a slight element of luck as to which clouds hit you, how hard and when," he said. Overall standings: Telefonica (Spain) 101 points, Camper (Spain/New Zealand) 83, Groupama (France) 73, Puma (USA) 53, Abu Dhabi Ocean Racing 43, Team Sanya (China) 17.